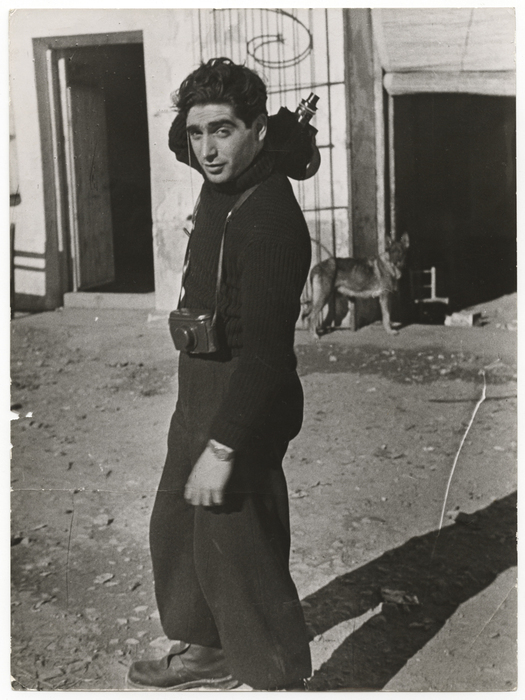 Born André Friedmann in Budapest, Robert Capa left Hungary in 1930 for Berlin, enrolled in the Deutsche Hochschule für Politik as a student of journalism and political science, and served as a darkroom assistant at the Deutsche Photodienst Agency. With the rise of the Nazis in 1933, Capa left Germany for Paris, where he shared a darkroom with Henri Cartier-Bresson and Chim (David Seymour). He worked regularly as a photojournalist, and between 1936 and 1939 made several trips to Spain with his companion, Gerda Taro, to document the civil war. His photographs from this conflict, including his most famous image, Death of a Loyalist Soldier (1936), were heralded almost immediately for their stunning impact; Picture Post termed him "the greatest war photographer in the world" in 1938. When World War II began, he moved to America and worked freelance for LIFE, Time, and other publications. From 1941 to 1946, he was a war correspondent for LIFE and Collier's, traveling with the US Army and documenting Allied victories in North Africa, the Allied landing at Normandy, and the Allied capture of Leipzig, Nuremberg, and Berlin. After the war, Capa joined Henri Cartier-Bresson, Chim (David Seymour), and George Rodger in founding Magnum, a cooperative photography agency providing pictures to international publications. In 1948-1950, he photographed the turmoil surrounding Israel's declaration of independence. He traveled to Hanoi in 1954 to photograph the French war in Indochina for LIFE; shortly after his arrival, he stepped on a landmine and was killed. Robert Capa made photographs that achieved their exceptionally powerful effect through his strong connection to and affection for people. This attitude, and his use of the small 35-millimeter camera, allowed him to approach his subjects and throw himself into the action as no one else. The result was a breakthrough in the history of photojournalism. Magnum Photos represents Cornell and Robert Capa.